With a vast network of paved, urban trails, paths in Anchorage don’t end with the coastal trail. You’ll find many small trails stitch together different neighborhoods, but there are three large trails particularly worth exploring. Ship Creek Trail starts a few blocks east of the Coastal Trail. This 2.6 mile route is often overlooked in favor of its famous sibling. Pick up the trail along Ship Creek Avenue between Comfort Inn and Bridge Seafood Restaurant. A walk or ride reveals fisherman in the creek, salmon swimming upstream and trains of the Alaska Railroad headed north to Denali National Park. Ready for a longer ride? The trail links to the 15 mile long Glenn Highway bike path to Birchwood. Branching off the Coastal Trail at Westchester Lagoon, Chester Creek Trail’s four mile route follows the creek through city parks and greenbelts. It runs out to Russian Jack Park, itself filled with more than a few miles to explore. The eastern end of Chester Creek ties into many neighborhood trails and also the main trail route south through Anchorage, Campbell Creek. Campbell Creek Trail is a 7.5 mile backbone of South Anchorage trails. Follow the meandering course of the creek downstream. Stop for a bite at local favorites the Peanut Farm or Arctic Roadrunner. Between west Dimond Boulevard and the fringes of Far North Bicentennial Park, the trail is a convenient connection between the U-Med District and south Anchorage shopping. Exploring the trails is easy. 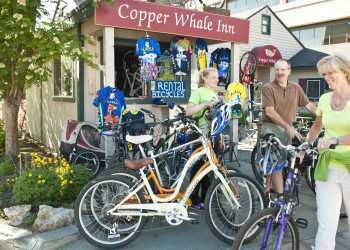 Many bike rental businesses operate in Anchorage, and bike shops are sprinkled throughout the city for easy tuneups and quick repairs.